1 How much do you know about the history of punctuation? How much do you know about the history of punctuation? Ancient Greek Boustophedon Inscription from Wikipedia Commons. Bidirectional text with no word spacing, punctuation and a single case. This file is licensed under the Creative Commons Attribution ShareAlike 3.0 License. Punctuation did not arrive at the same time as text. It is very much an after thought. Though punctuation marks have been used in texts for at least 2000 years to help structure texts and clarify meaning, for most of their history, texts existed without a standardized system of punctuation. In early texts, there were often no marks to aid the reader, nor were there any spaces between words. Punctuation is “the use of spacing, conventional signs, and certain typographical devices as aids to the understanding and correct reading, both silently and aloud, of handwritten and printed texts” (Encyclopedia Britannica). The word punctuation comes from the Latin word punctus or point and until the sixteenth century English punctuation was known as pointing (Reimer, 1998). At different times punctuation has been expressed through, marks, space or graphic symbols. However punctuation is indicated, it is possible to identify two major trends in the function of punctuation: as an aid to speech (rhetorical) or as an aid to grammatical clarity (syntactic). Unfortunately, this clean dichotomy of punctuation does not always work as sometimes punctuation “marks both written and spoken functions in the same text” (Baron, 2001, p. 19). As an example, a comma in a contemporary text often indicates both a pause and a separation between clauses. Nevertheless, looking at the way punctuation is used can offer an insight into what extent a society views writing as dependent on speech. The rhetorical form of punctuation is older than the syntactic, and it aids the reader in giving a faithful oral performance of a text. Punctuation had at its origin a physiological component (Deneau, 2003) as it ‘pointed’ to the speaker where to breathe. In ancient Greek punctuation marks also indicated the length of the pause to be made. Later they became “elocutionary guides” (Deneau, 2003) as pauses were added for effect, not just for breath. There are similarities between rhetorical punctuation and musical notation for “breaths” (Deneau, 2003). In fact the comma symbol of today originated in the punctus elevatus or virgule that comes from music (Baron, 2001). The syntactic use of punctuation uses devices to show the grammatical relationship between clauses in a text. The functions of syntactic punctuation are to separate clauses and to avoid ambiguity. In modern grammar, fixed rules determine the use of syntactic punctuation and this kind of punctuation perhaps more resembles parentheses in mathematics than musical notation. Syntactic punctuation is closely tied to the silent reading of texts and marks a point where written language developed a life of its own, separate from speech. Studying the way punctuation has been used historically offers a glimpse at the shifting perceptions of text and speech as “dependent or independent modes of language” (Baron, 2001, p.16). Therefore, to talk about the functions of punctuation is to talk about the functions of writing. Writing can be used to represent a speech act, or it can be used as a way of producing records, be they of an occurrence, of a thought or of a conversation. When an author produces a text with the idea that it is to be read aloud, then any punctuation that is added is to help the performer identify where to pause, for how long and when to take a breath. If the author views the text as a silent document, as a form of language independent of speech, then any punctuation used will be for emphasizing clause structure and meaning. Punctuation was once entirely rhetorical because texts where viewed as oral aids. As written language developed an identity of its own and reading became a silent act, punctuation changed accordingly. Nevertheless it never succeeded in becoming completely syntactic because writing has never been able to separate itself completely from speech. Baron (2001, p.20) notes that “the persistent importance of speech as a means of social exchange has ensured that writing has never fully relinquished its function as an aid to subsequent speech”. Since there is a blurring in the function of writing, there is a consequent blurring in the function of punctuation. Thucydides Manuscript. 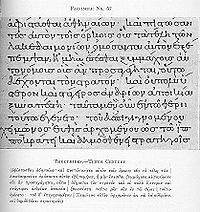 Greek showing evidence of punctuation.From Wikipedia Commons. This file is in the public domain. Punctuation can be an essential clue to meaning when reading a language that is not your native tongue. It is therefore not surprising that syntactic punctuation seems to have been established by non-native readers of Latin. Latin and Greek texts served their native audience in classical times as aids to oral reproduction. In the late classical period, Latin became an international language on which Christian teachings were spread throughout Europe (Baron, 2001). At this time many readers of Latin as a foreign language were not comfortable in speaking Latin, and it is natural to see why Irish scribes added syntactic and not rhetorical punctuation to Latin texts to improve the clarity of meaning (Saenger, 1997). The monks first added space between the words and then punctuation marks to clarify the clause structure. This system spread to the European continent by the tenth century when scholars rediscovered the lost works of the classical period. However, it was not until the sixteenth and seventeenth centuries that syntactic grammar was formalized in the English language (Baron, 2001). Isidore of Seville from Wikipedia Commons.This file is in the public domain. 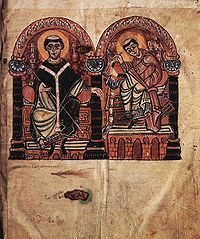 It is clear from the writings of Isidore of Seville  (Baron, 2001) that silent reading existed in the seventh century and from St Augustine’s Confessions  that it existed even earlier in the fourth century (Saenger, 1997), though it did not become common until many centuries later. The movement towards reading silently and the movement towards syntactic punctuation are intertwined. However, it is difficult to know which one was the determinant. Garilov (1997) argues that silent reading existed before the introduction of word spacing and syntactic punctuation into texts since to read a text aloud is not easy unless your eye jumps ahead (and so reads silently) to construct meaning from the flow of letters in scripta continua. The author believes that punctuation equally facilitates both spoken and silent reading. However, Saenger (1997) suggests that the move from sounded reading to silent reading coincided with the advent of syntactic punctuation and word spacing, at least in languages that use vowels. Saenger (1997) argues that for sounded reading in the classical age it was not necessary to have spaces because texts were normally well known by their readers and also because the rhythm and rhyme they contained aided recital. If we accept Saenger’s views, then by adding both space and punctuation, silent reading became common by the end of the 14th century, meaning that punctuation was determinant in its growth. If this is the case then the educational consequences of silent reading are the consequences of punctuation as well. Punctuation made both the writing and reading of more complex thinking possible. Also, since silent reading is much quicker, scholars were able to read more and so become more knowledgeable (Baron, 2001, p. 22). Silent reading changed the way people related to texts and individualized education. Silent reading facilitates an individualization of the learning process that ties in with the protestant teachings of “developing an individual relationship with God” (Baron, 2001, p. 22). Silent reading also changed libraries. Previously, libraries had been divided into individual spaces and the books locked away. As silent reading gained popularity, Libraries began to be housed in open spaces with reference sections available for consultation (Baron, 2001, p. 30) According to Saenger (1997), all of these are consequences of syntactic punctuation. In the English language before the 17th century, writing was used mainly for record keeping, or for recording speech for future rhetorical performance (Baron, 2001)). During the 16th and 17th centuries there was a separation of the written and printed word from speech (Baron, 2001) and writing came to have a life of its own. Scholars (eg. Bacon ) and grammarians (eg. Manutius ) extolled the use of syntactic punctuation over rhetorical punctuation to improve the clarity of texts, and by the mid 19th century grammarians were formalizing punctuation solely in terms of grammar and sentence structure” (Deneau, 2003). Nevertheless, despite the best efforts of many grammarians and printers, rhetoric has continued to influence the use of punctuation. In fact, there has been a “schizophrenic mix between professed function and actual usage” (Baron, 2001, p. 28) ever since the advent of syntactic punctuation. There are several reasons why rhetorical punctuation has resisted the intents of printers and grammarians to suppress it in favor of syntactic punctuation. Firstly Bolton argues that there are areas of social interaction where orality has continued to be important. These are “politics, public presentation of self, religion and social bonding”(Baron, 2001, p18). Another reason is that there has been a rhetorical nature to education in American universities due to their professed aim of training protestant ministers (Baron, 2001). Finally, Connor (2009) suggests that the move to silent reading is really a shift of the voice from the exterior to the interior; instead of projecting into exterior space, in silent reading the voice is projected into one’s interior space. Therefore rhetorical punctuation still serves a purpose for silent readers as an aid to the rhetorical quality of their inner voice. As we have seen, there is a relationship between how writing is viewed and the functions assigned to punctuation. Syntactic punctuation has dominated since the age of the printing press because writing has been viewed as independent from speech. However, with the remediation of print in the late twentieth century, writing has become more speech like and “we see writing as an interchangeable alternative to speech rather than a distinct medium with its own functions and conventions. (Baron, 2001, p. 55). This does not imply a movement towards the rhetorical punctuation of the past since “writing has increasingly become a mirror of informal speech, rather than a durable record of formal speech events or a means of re-presenting speech as public rhetoric” (Baron, 2001, p.54). We are now writing as we speak and it is to be expected that this tendency will be shown in the way this new generation punctuates. Punctuation resists efforts to be tied down, but instead continues to reflect the convoluted nature of the relationship between orality and literacy. Saenger, P. (1997). Space between Words: The Origin of Silent Reading. Stanford University Press, Stanford. This page was last edited on 2 November 2009, at 03:31.